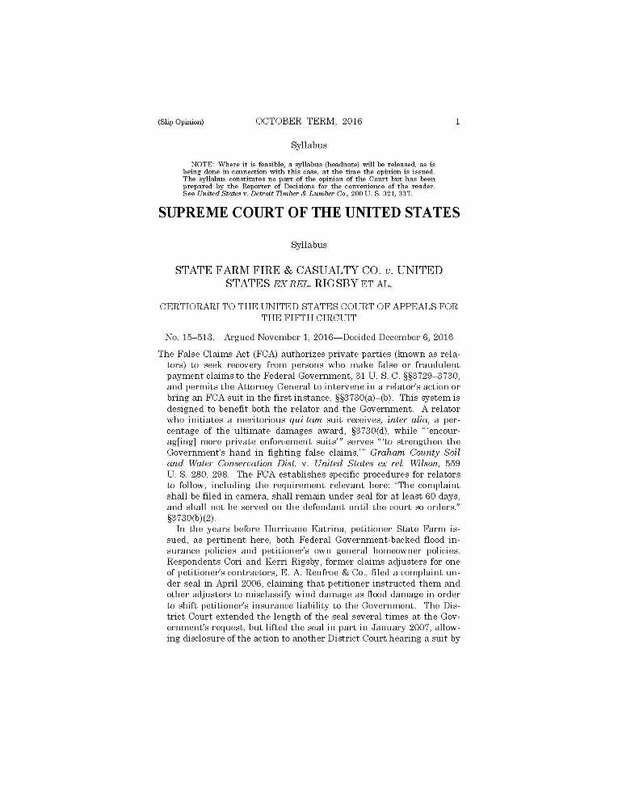 BREAKING: US Supreme Court unanimously rules in favor of Rigsby Sisters against State Farm! The bottom line is “Trailer lawyers” > than State Farm’s lawyers. Author Douglas HandshoePosted on December 6, 2016 December 6, 2016 Categories SopTags Cori Rigsby, False Claims Act, Kerri Rigsby, National Flood Insurance Program, USA Ex Rel Rigsby v State Farm, Whistleblowers, Wind Claims Dumping4 Comments on BREAKING: US Supreme Court unanimously rules in favor of Rigsby Sisters against State Farm! Supreme Court grants Cert on Ex Rel Rigsby…. Breaking news this AM on twitter folks. Look for State Farm to do well in what has been a very favorable venue for them so the case is bound to die there. After all, the NFIP ratepayers are really a bunch of freeloaders and all 5,206,241 of you don’t equal up to one member of the Rust family let alone State Farm in the eyes of the Supreme Court. Author Douglas HandshoePosted on May 31, 2016 May 31, 2016 Categories SopTags Crooks in Gucci Suits, False Claims Act, National Flood Insurance Program, USA Ex Rel Rigsby v State Farm5 Comments on Supreme Court grants Cert on Ex Rel Rigsby…. Looking at the roster of combatants this false claims act case looks to be a fashionable fight and those that want to read the complaint can click here to download it for free from the DoJ. RFP was also Johnny on the Spot last night with an interesting link so for those of you that want to get an understanding of why this lawsuit has electrified the news power-user community here on the coast is to understand the man who the government has set its sites upon. Both sides are appealing aspects of Judge Ozerden’s rulings in the case to the 5th Circuit Court of Appeals. Seems like it was just yesterday when South Mississippi’s fluffer congressman Steven Palazzo was patting himself on the back and claiming credit for fixing a disaster he helped create in the Biggert-Waters National Flood Insurance Program, which has dumped on the premium payers, billions of dollars in Wind Obligations private insurers stuck the program in the aftermath of Hurricane Katrina. Vitter and Landrieu have also warned of the drastic effects of the upcoming flood insurance premium increases, and the two senators have unsuccessfully tried to attach amendments to other Senate bills to stop those rate hikes. Some senators have objected to efforts to stop implementation of the Biggert-Waters Act, arguing that Congress passed that law, by large margins, to make the National Flood Insurance Program financially sustainable. So how electing a sold out Ed Rust shoe shine boy working out for everyone in South Mississippi? On the bright side for those that are in decent financial condition the repo market has never been better down here in Soggy Bottom as ordinary folks are financially crushed and forced out under the weight of corporate greed and their own sold out politicians. State Farm began their defense in the Rigsby whistleblower lawsuit involving allegations they and other insurers defrauded the National Flood Insurance Program after Hurricane Katrina early this week and I immediately noticed a foul odor that seemed to emanate from the Federal Courthouse in Gulfport when former NFIP Director Dave Maurstad took the stand for State Farm. To understand Maurstad and the concept of the revolving door, you gotta understand these guys circle from private sector insurance related jobs to government regulatory positions and back each time collecting more career enhancing favors. With this bunch it is always about the next job so the insurance industry could not have had a better water boy in place when Katrina hit than Dave Maurstad. But once upon a time ol’ Dave was not so keen to testify about the NFIP handling of Hurricane Katrina claims no siree. In Bolden v FEMA for instance Dave had to be compelled to show up at the Federal Courthouse to testify about the expedited claims process he and Lecky King came up with after Katrina. Worth noting is rather than let Maurstad testify FEMA opted to settle Bolden immediately. The bottom line is most people I listen to think Maurstad is a self serving hack under whose watch the NFIP sank into technical insolvency. Lecky King, on the other hand, said State Farm attorneys prepared her for her testimony. She spent her last few years at the company working on policyholder lawsuits filed after Katrina and on the case against her, which at one time was part of a criminal investigation that never resulted in charges.